With the support and direction of MGTO, architecture and design students at USJ spent last semester working on proposals for the renovation of the Ritz Building in Senado Square. 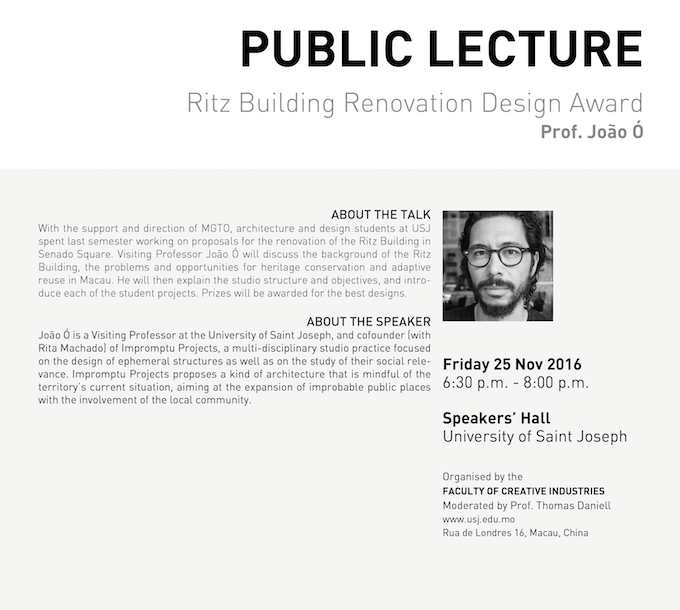 Visiting Professor João Ó will discuss the background of the Ritz Building, the problems and opportunities for heritage conservation and adaptive reuse in Macau. He will then explain the studio structure and objectives, and introduce each of the student projects. Prizes will be awarded for the best designs. João Ó is a Visiting Professor at the University of Saint Joseph, and cofounder (with Rita Machado) of Impromptu Projects, a multi-disciplinary studio practice focused on the design of ephemeral structures as well as on the study of their social relevance. Impromptu Projects proposes a kind of architecture that is mindful of the territory’s current situation, aiming at the expansion of improbable public places with the involvement of the local community.